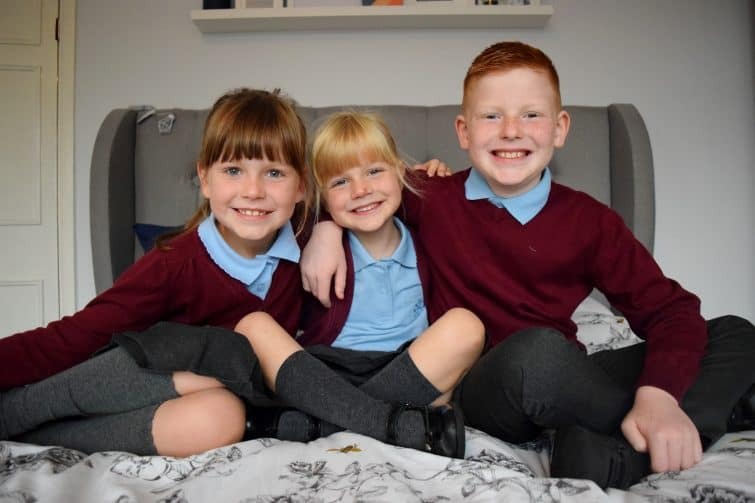 Five Tips to get the kids to school on time! Particularly when the kids were younger, people would often ask me how I managed to get them all up and out on time for school. Don’t get me wrong, our mornings don’t always run smoothly and there’s definitely days where Ben reaches the school gates as the bell rings – but you won’t find a late mark on their school records. 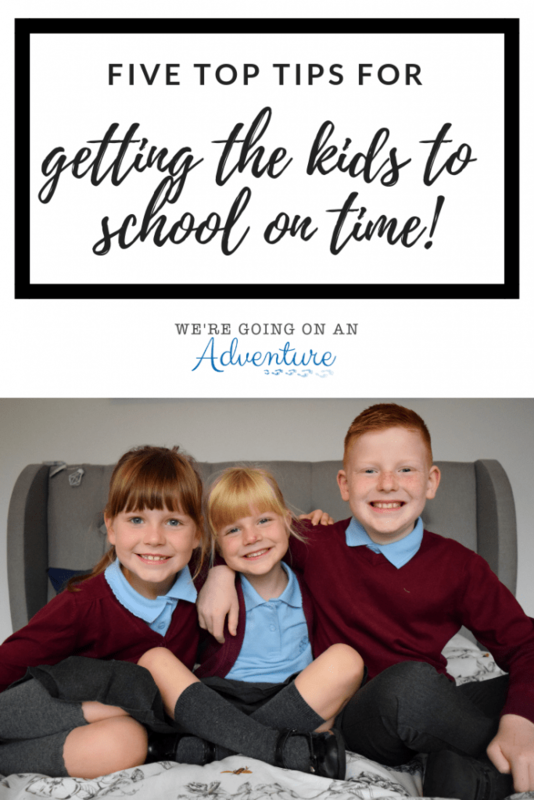 Of course it’s easier to get them all out of the door on time now than it was when I had three under five and had to get Ben to school whilst sorting out a newborn and a toddler at the same time – but I wanted to share our top five tips for getting the kids out to school on time and how these now work for us as the kids are a bit older. I get up about 20 minutes before the kids which means I’ve got time to have a shower and get dressed before I even need to start thinking about them. I started doing this when I went back to work after having Ben and it was a game changer. Getting up before the kids means that I’m not rushing around trying to get myself organised at the same time as making their breakfast or brushing hair. Everything is much calmer if I’m already ready for the day when they get up. Check the night before that everyone has what they need for the following day – Do they know where their shoes are? Do they need a clean pair of trousers? Have they put their reading book back? Do they need dinner money or a packed lunch? As the kids have got older this is now something I expect them to do for themselves (with reminders) – both because it makes my life easier but also because its an important life skill to teach them! Doing the same things in the same order each day means you’re less likely to forget things and you know how long it will take. For us that means you don’t come downstairs till you’ve got dressed – (I used to give them breakfast first to avoid issues with spilling but that just meant they had no incentive to get dressed, now they aren’t allowed breakfast till they are dressed so they get ready much quicker). After breakfast it’s back upstairs for teeth brushing before I do their hair, they put on their shoes and get their last bits and pieces together. If there’s time they sit and read their school reading books – we don’t have the TV on in the morning as it just slows everything down. I expect my kids to get dressed by themselves for school and always have done. I will help with tights or fiddly buttons but for the most part the need to get themselves dressed. Perhaps it would be quicker if I did it for them but they’re going to need to be able to dress themselves for PE anyway and the sooner they learn to do it for themselves the easier your mornings will become. Do you have any top tips for getting out for school on time? I wrote some years ago about how I thought it was a great idea that families were being fined for being persistently late to school. This sounds much like our mornings. The boys do have breakfast before getting dressed but they know if they get dressed quickly then they have more time to play before school and nursery. If all goes according to plan they have about half an hour to play before we have to leave, and if it doesn’t well then we have an extra half an hour which means we’ve never been late yet 🙂 I’m very strict about shoes, coats and hats etc all being put in the right place by the door when we come in from school so we always know where they are in the morning! 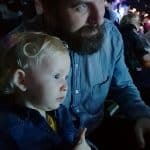 I used to find that having breakfast before they got dressed just left no incentive for them to get dressed – and the spillage issue wasn’t such a problem as they got older thankfully. There’s nothing worse than trying to find a lost shoe when you’re trying to get out to school on time is there!! Yeah I’d be inclined to get them all ready at once.